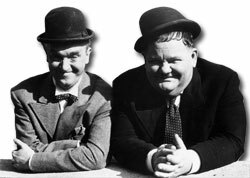 A lot of animals shared the screen with Laurel and Hardy. Which one was your favorite? Select the button next to the animal of your choice then select the "cast your vote" button. Write in votes may be submitted by selecting "other" then typing your choice into the accompanying field. Remember, every vote counts but please only vote once. This survey started in September 1998. Which was your favorite animal in a Laurel & Hardy film?